Industry-giant MuscleTech has been around for nearly 25 years, but in supplement-business years, that can feel more like 80. With start-ups emerging every year trying to be the next, well, MuscleTech, this mighty company has earned a place as a standard bearer in quality, innovation, volume, and global reach. The nine-time Bodybuilding.com Supplement Awards winner started as a modest mail-order business in 1995, but three of its products, Nitro-Tech, Cell-Tech, and Hydroxycut, quickly became trailblazers in their respective categories. One of the first supplement companies to invest in serious research to back its products, MuscleTech has expanded its range to more than 140 global markets. We spoke with leaders at the company about what made MuscleTech so successful so fast, its commitment to expanding research, and how the future looks in the coming years. Two decades ago, the supplement industry was dominated by a few very large companies. How did MuscleTech get its foot in the door? MuscleTech was founded 24 years ago in what was, even then, a fast-growing industry. There were a variety of supplement companies touting the "next great" product breakthrough based on published studies, but not always formulating and dosing ingredients according to those studies. MuscleTech broke the mold by being the first company to start sourcing studies and dosing according to the research. MuscleTech grew by effectively marketing its products and building up its brand equity by delivering breakthrough, category-leading innovations, which brought significant demand for its products. At that time, the company evolved from a mail-order business to national distribution at top brick-and-mortar retailers and into today's online business model. In very short order, this forced the business to evolve from start-up mode, to growth mode, and eventually turn into the sophisticated, well-structured, consumer-products company that it is today. Today, MuscleTech is laser-focused on bringing best-in-class sports nutrition and weight-management supplements to people around the world, helping them achieve new heights, improve performance, and enhance their lifestyles. The company didn't take long to become an industry leader. How difficult is it to maintain market leadership? Twenty-four years ago, the company mantra was "Supplements That Work." Today, it's still focused on delivering "Superior Science for Superior Results." Either way, our core values have not changed over the last two decades. We continue to focus on using leading science to give consumers the best possible supplements available anywhere. Every manufacturer touts "science" and "research" in their marketing. How is yours different? Being an industry leader means staying on the cutting edge of innovation, whether it's through new ingredients, formulas, product formats, or scientific studies. MuscleTech always strives to be first-to-market with new innovations that deliver results. Specifically, we maintain an unwavering commitment to multimillion-dollar R&D initiatives that enables us to continually scour the market for new science, partner with researchers at leading universities and institutions around the world, and ultimately commercialize winning concepts that enable consumers to experience performance products that truly support better fitness results. It's one thing to develop products that are full of catchy ingredient names or emerging compounds that give the illusion of an effective product, but with MuscleTech and Hydroxycut, we focus on engineering products with key ingredients supported by sound science, delivered in efficacious doses that support real results. While it's important to be first to the market, MuscleTech thinks it's just as important to get it right, which is why we only use the best ingredients available. Whether it's protein, amino acids, or any of our numerous exclusive ingredients, we strive to deliver only the best. Our transparent profiles and commitment to ingredients in only scientifically studied doses helps build trust with consumers. That enables them to feel confident they're putting only the best supplements into their bodies. Can you tell us about your research partnerships? Partnering with a world-leading sports-research university like the University of Toronto exemplifies MuscleTech's commitment to providing sports-nutrition products that are backed by leading-edge science. That's why we entered into a 20-year partnership to create the MuscleTech Metabolism and Sports Science Lab. This is unprecedented in the industry and is a true testament to the lifelong commitment our leadership team has made to improving the quality and efficacy of athletic performance supplements. This University of Toronto partnership will further develop the industry's understanding of the mechanisms behind sports-nutrition ingredients. It will also inspire our researchers to engineer the most-effective supplements to help users reach their fitness goals faster. Based on all of this, it may not surprise you to know that our domestic and international partners are showing strong interest to collaborate on new product development and science projects. The MuscleTech innovation pipeline is loaded with a number of exciting new products you should see in market in 2019 and beyond. Can you elaborate on how this all benefits the consumer? Being an industry leader means doing what's best for the consumer, while also helping the supplement industry to grow, thrive, and deliver product offerings that support greater individual lifestyle and performance results. For example, decades ago, the marketplace was full of whey protein powders. MuscleTech researchers partnered with leading scientists at a third-party sports-performance lab and discovered that by combining whey protein with a precise dose of creatine, you get better results than with whey protein or creatine alone. This was pioneering research that changed the face of the industry and continues to positively affect the regimens of serious athletes, weekend warriors, and lifestyle consumers alike. At MuscleTech, we're committed not only to industry-leading research and development, but also to covering discoveries with numerous patents, which helps legitimize our product and brand offerings, and ultimately protect the consumer. Tell us about your headquarters. For those who will never get to visit, what's it like there? In 2008, we moved into our new global headquarters, a 131,000-square-foot facility with a 7,000-square-foot gym that includes the latest Hammer Strength equipment, powerlifting stations, and dumbbells up to 250 pounds. There's also an adjoining yoga studio and two laboratory-testing rooms that include a Bod Pod machine and V02-max machine. This is a fully-equipped facility that allows our employees and guests to enjoy world-class workout facilities whenever they want. When MuscleTech athletes come for photo shoots, they're treated to a state-of-the-art production studio that includes a photo lab, audio booth, green room, and makeup studio. Meanwhile, all team members have access to a cafeteria staffed with full-time cooks that help make it easy to eat clean, get lean, and maintain a healthy nutrition intake. The building also features multiple other labs where MuscleTech researchers use state-of-the-art equipment to mix, sample, and experiment with some of the latest ingredients. In fact, our extended R&D team includes researchers in the areas of human biology, biochemistry, and toxicology. This includes a number of published authors and doctors. It's a fantastic environment to work in and makes it a lot of fun to come to work every day. A lot of Bodybuilding.com customers become familiar with MuscleTech through the sponsored athletes featured in various articles and videos. Can you tell us about your athletes? Team MuscleTech brings together expansive knowledge in training, dieting, and supplementation. From pro bodybuilders to fitness models to the everyday lifters, MuscleTech's team of experts share with you their insights on how to reach your specific goal, no matter the obstacles that stand in your way. 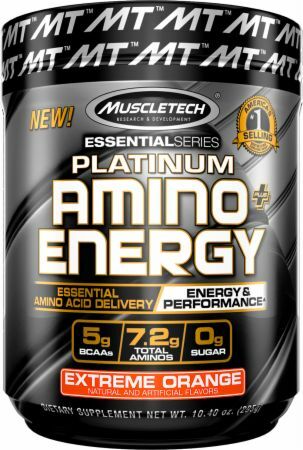 What MuscleTech products are the best-sellers on Bodybuilding.com? Bodybuilding.com consumers are highly educated; they take the time to look into ingredients and products. 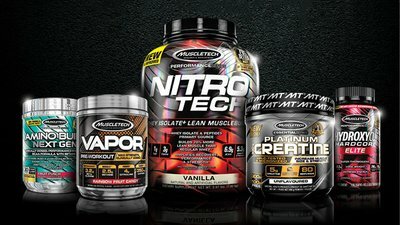 MuscleTech has many top-selling products on Bodybuilding.com, including Nitro-Tech 100% Whey Gold, Vapor One, and Platinum Series 100% Creatine and Multivitamin. MuscleTech has the benefit of more than two decades of leading product development, marketing, and branding. Before we close, can you explain what your company means when it says its products are fully disclosed? MuscleTech Supplement Facts panels are fully disclosed, which means that no matter what the product is, you can see exactly what ingredients are in it and exactly how much of that ingredient is in each serving. That's very important. Quite simply, it means you know exactly what you're consuming whenever you take any MuscleTech product. We don't believe in hiding behind proprietary blends just to make label claims. Instead, every key ingredient is scientifically researched and in proper dosages for better results!